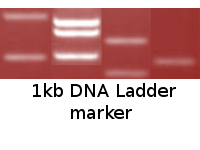 Description: The 1kb DNA Ladder is suitable for sizing double-stranded DNA from 1kb to 8kb. The 4kb band has increased intensity to serve as reference point. The double-stranded ladder can be visualized on 1% to 2% agarose gels after ethidium bromide staining. Preparation: Complete digestion of MINOTECH biotechnology plasmid mix with appropriate restriction enzyme yields the following 7 discrete fragments (in kilobase pairs): 8, 6, 5, 4, 3, 2, 1.